This post has been contributed by Michael Murray, Communications Volunteer with the Stanley Park Ecology Society (“SPES”). I have been following SPES since I moved into the West End over a decade ago and I have been a member for four years. I wanted to offer the team an opportunity to share their news, events, and work so I have created “SPES Saturday” where they contribute and share stories with my audience once a month. If you’ve been out and about the last few weeks, then you’ve surely noticed the vibrant orange, yellow or red hues of Salmonberries lining the trials and walkways of Stanley Park. 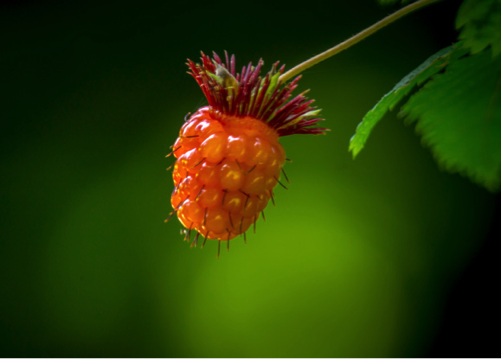 Often overshadowed by its more famous cousin the raspberry, salmonberries or Rubus specatibilis play an important role in the Park ecosystem providing sustenance for many songbirds and other animals alike. Salmonberry in Stanley Park. Photo by Michael Schmidt. The plant is native to the west coast of North America growing from the California coast to Alaska and prefers damp soil often growing along streams or marshy areas such the trails around Beaver Lake. The salmonberry bush is supported by long thin perennial stalks that go from green to rusty brown. The bright pink flowers and distinctively serrated green leaves make them easy to spot amongst the other foliage in Stanley Park. Matt Reinbold, Bismarck, Wikia Commons. Vancouver’s recent rains and warm weather have caused an explosion of these colourful berries. This is good news for the Swainson’s thrushes (Catharus ustulatus) which count the berries as an important part of their diet. These tiny songbirds can be spotted darting from bush to bush gorging on berries as they go. 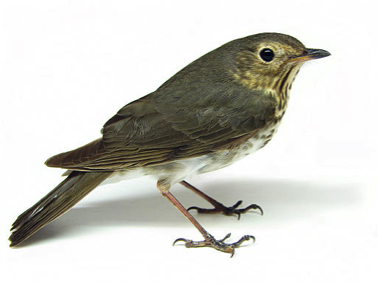 These migratory songbirds visit the Park during the spring and summer months and can be recognized by their characteristic upward spiraling song. Click here to hear for yourself. The tasty berries are definitely fit for human consumption and have been used by west coast indigenous cultures for centuries. The leaves were used to line baskets, the red pigments as dye, and the leaves dried and made into astringent teas. It is said the berries resemble the colour of salmon roe and that’s how they came to be named. Next time you’re out exploring the Park be sure to keep an eye out for these wild treats, but please leave them on the bushes for Stanley Park’s birds. This post has been contributed by Michael Murray, Communications Volunteer with the Stanley Park Ecology Society. If you want to support a non-profit organization that makes a difference for wildlife and people in Stanley Park, please make a donation or become a member of SPES. For more information visit the Stanley Park Ecology Society website.